Cheers – It´s 4th July! Being the sort of girl who needs no excuse to raise a glass, here´s a big “Cheers” to all my new blogging pals celebrating the 4th July. Hope it´s a great day for you all. As you know, it´s cherry season here up the mountain and after stoning far too many kilos for jam making, I decided to ring the changes and make something gorgeous for the cooler months. I came across a wonderful recipe over on Olive and Artichokes for a cherry liqueur they have made with Eau de Vie. We can´t get that here, at least, I´ve never come across it…but I didn´t let this stand in my way! 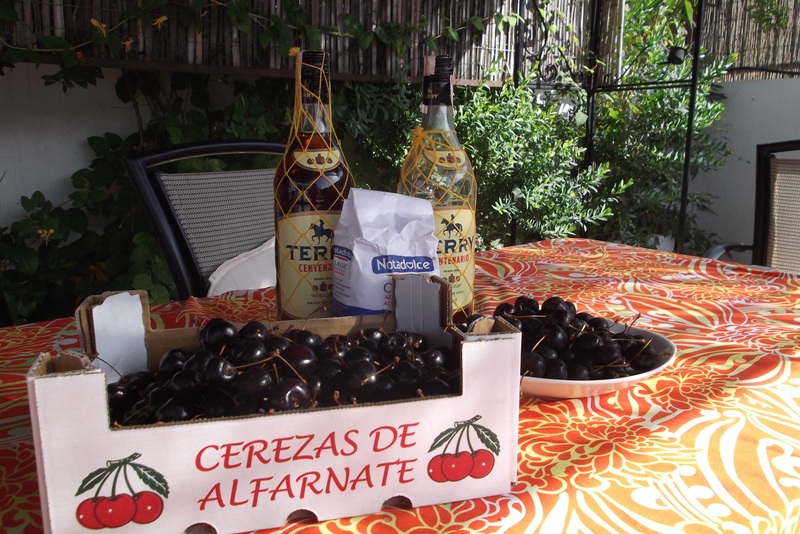 I bought a bottle of Spanish Brandy, not one of the rough ones might I add, and got my sugar, cherries and bottles ready. 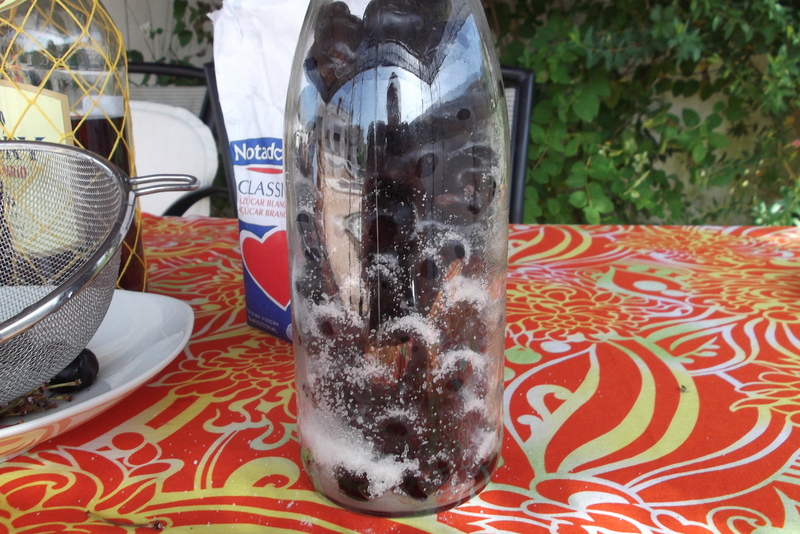 I followed the instructions given in the recipe, that is layering cherries and sugar and then filling the containers with liqueur. Hopefully in a few months time I´ll have a delicious cherry flavoured brandy and some brandy flavoured cherries. Can´t wait! Just over three weeks ago I started to make some alcoholic ginger beer. 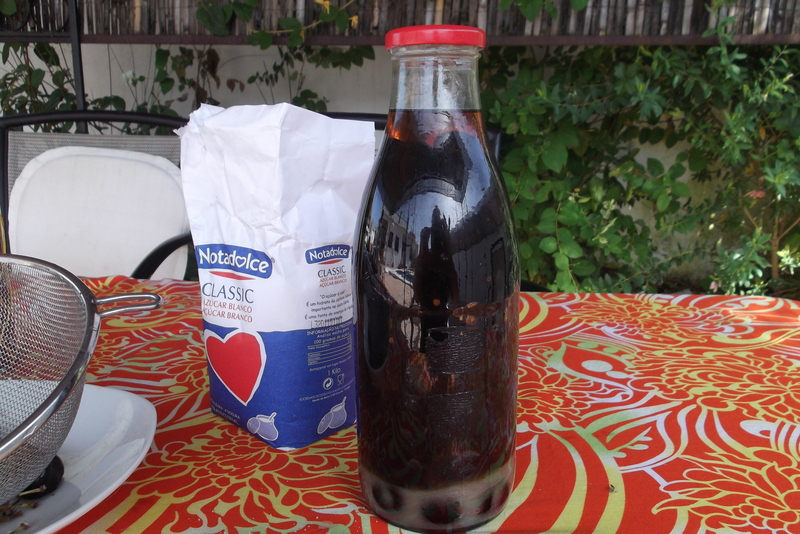 If you want to give it a go, you´ll find the recipe here. 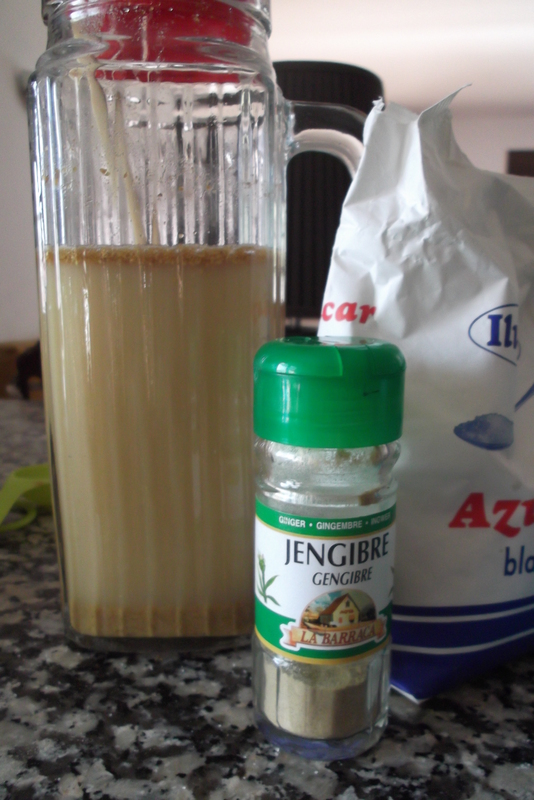 It´s very simple, all you need is a sachet of yeast, a jar of powdered ginger, sugar and a jar or jug you can loosely cover. 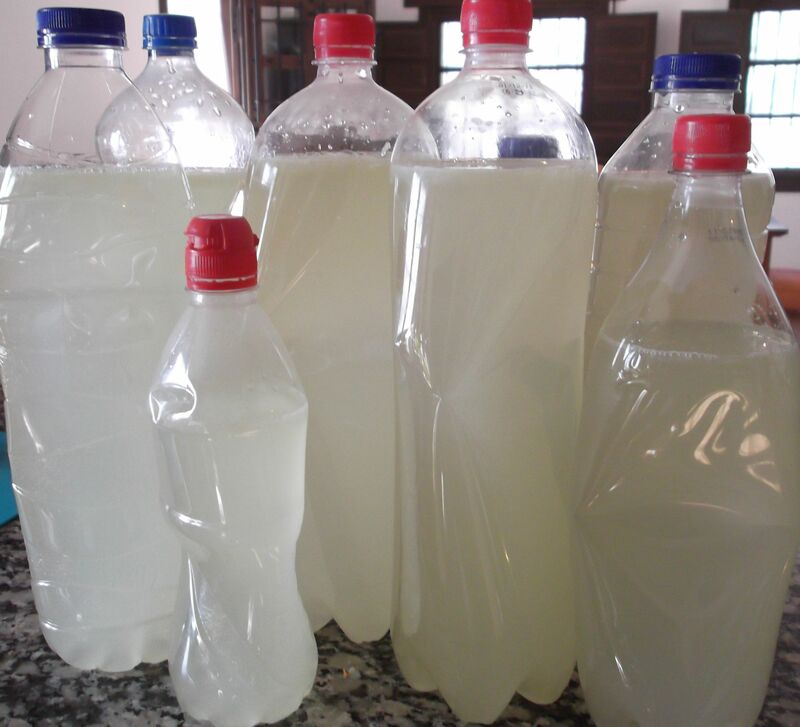 After a week of adding yeast and sugar to your initial mixture (see the recipe) you´ll add water, lemon juice and more sugar to make about 7 litres of ginger flavoured drink. You need to leave some space in your plastic bottles for expansion, so only fill them about three quarters and then squeeze some of the air out before sealing them. If you don´t do this you´ll have exploding ginger beer all over the place and it´s very sticky. I know this from experience! 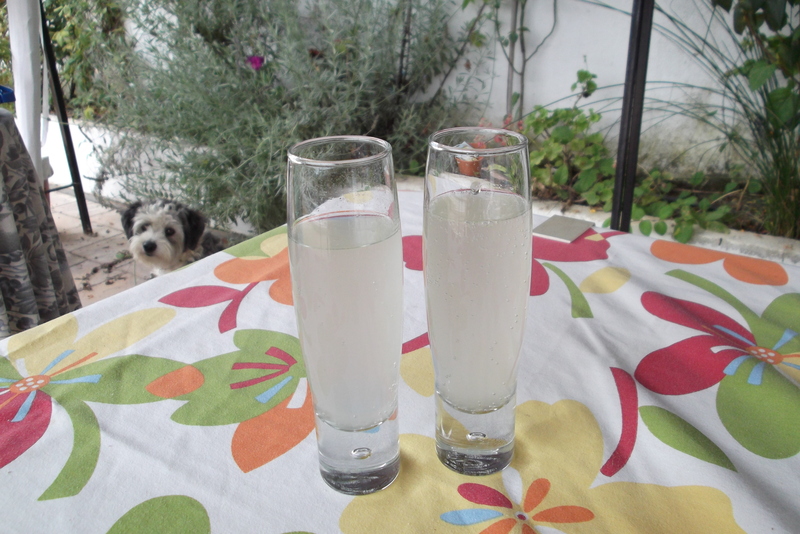 Once you´ve been patient you will be rewarded with gorgeous sparkling, lemony, gingery Ginger Beer. I don´t know exactly how alcoholic it is, although it does get stronger the longer you leave it. After about 3 months it starts to taste acidic, but I don´t suppose you´ll have it for that long as it´s delicious. 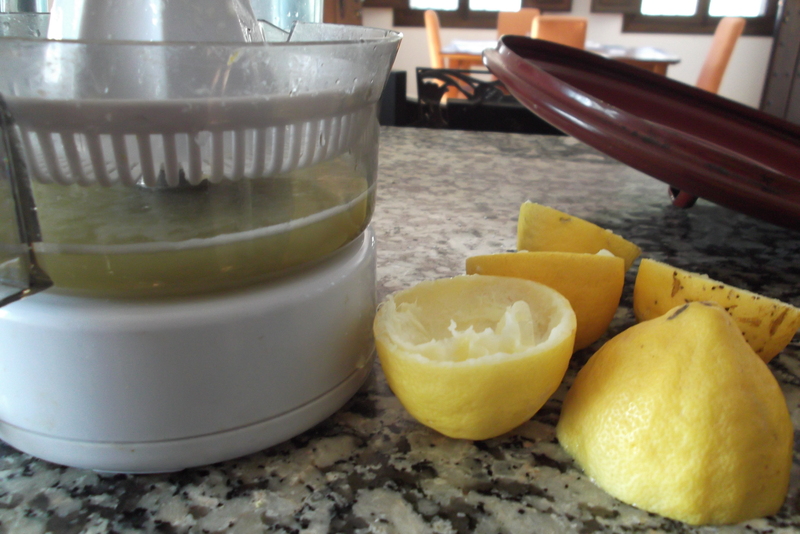 And if you can´t wait 3 weeks, wait a week and mix it up with soda or water for a refreshing, non alcoholic drink. So good, even Alfi wants to get in on the act! Your cherries in brandy will be very good! Eau de vie is just a name for any brandy-like liquour made from the remains of the grapes after wine making, so your Spanish brandy will be fine. Here the cherries and brandy are served together in little dishes after dessert and with coffee, but they’re nice on ice cream too. Thanks for the link! Phew – am glad you are hopeful! Should have asked you first about putting in the link, apologies for my lack of blogging “etiquette”. Am not wishing the summer away, but am looking forward to trying it out! I think most bloggers are glad of a link – I certainly am. I’m sure the etiquette is that you don’t need to ask first. Phew – am glad I am not being a blogging “lout”! The ginger beer looks delicious – happy Independence Day everyone! Wow! Nice recipe! I have never tried to make any alcoholic drink before. This seems so refreshing!!! I bet you´ve been involved in some family wine making in Italy though! My parents stil make wine in London for their own consumption – they import the grapes from Italy (along with hundreds of other Italian families) in September. It´s great fun! Actually I am involved in olive picking each November! My parents in law have this beautiful property in Umbria, where they have lots of olive trees. Every November we join them to hand pick olives and it is so much fun! We then take them to the frantoio (the mill) to get olives pressed and we get our own extra virgin olive oil for a year! How wonderful! We picked ours in December this year and made our oil at a small old fashioned mill for the first time ever. Aren´t we both so lucky?! Nothing beats the taste of your own oil and olives. Wow that looks good! I bet it will taste just phenomenal. Thanks for the fourth wishes! Wow, this looks really good! I grew up drinking ginger beer so this sounds absolutely excellent! Happy 4th of July! Ginger Beer is that kind of “childhood memories” drink isn´t it? It is very delicious indeed….! So glad you noticed the glass. My best friend bought them for me when she visited from a catering wholesalers we go to (sad, but we love it 🙂 ) and the glasses are called “Bubble”! And don´t worry about Alfi, he and his dog “sister” Luna both got a big bone each from the butcher yesterday – they were bigger than them, they´re still chomping awy on them today! I’m all about that cherry brandy! As easy as it is to purchase a bottle of cherry vodka or liquor, there is something so very satisfying and fresh tasting of making your own. Cheers to you!! Hope you enjoyed a great 4th weekend! It makes it taste more special when you´ve made it – and then you can put it in little bottles and share it out! I love that you are always so busy doing fun stuff! Any excuse for a party round here! And it´s summer…so life is outside and late into the night as it´s too hot during the day. Even then the ice cream would probably melt pretty quickly! Wonderful!! I’ve got to put brandy on my “to buy” list. I know this is delicious! I can remember drinking it at yours last year. Thanks for the link will give it a go. Lovely to see Alfie enjoying the activities. Where there´s food or drink, you can guarantee Alfi will show up! 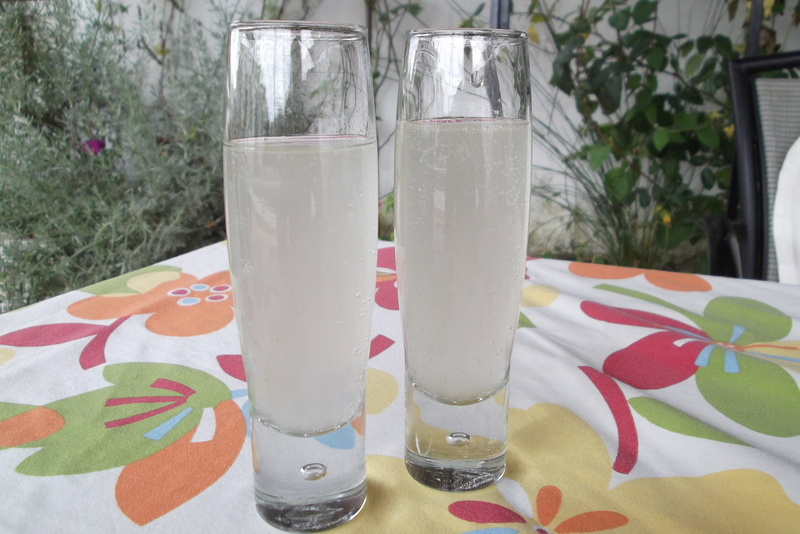 The ginger beer is so refreshing, am enjoying some today mixed with fizzy water. Yum! Thank you for sharing the technique. Once I start to see fresh cherries in the stores again, I’ll be making this. In the meantime, I’ll be thinking of some clever ways to use the finished cherries. Oh, and I’ll definitely be inviting friends over to enjoy them with me!